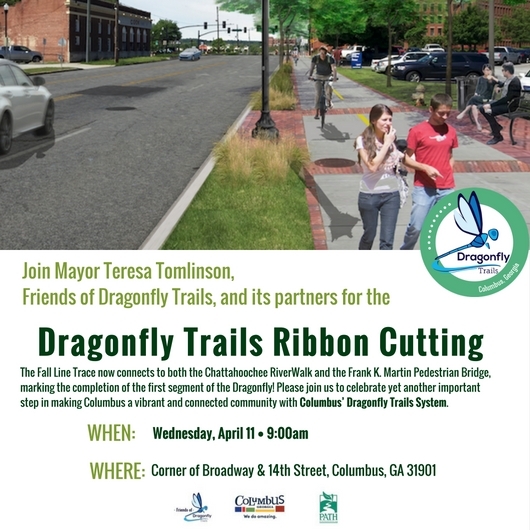 Columbus, Georgia -- Join Mayor Teresa Tomlinson, Friends of Dragonfly Trails and its community partners for the Dragonfly Trails Ribbon Cutting taking place on the corner of Broadway and 14th Street on Wednesday, April 11 at 9:00am. The Fall Line Trace now connects to both the Chattahoochee RiverWalk and the Frank K. Martin Pedestrian Bridge, marking the completion of the first segment of the Dragonfly. Please join us to celebrate yet another important step in making Columbus a vibrant and connected community with Columbus’ Dragonfly Trails System. This beautiful trail is part of the City's Rails-to-Trails project, and is contructed on an abandoned railroad route. The trail begins at the 14th Street Pedestrian Bridge and ends at Psalmond Road. The Dragonfly is 32 miles of new trails for Columbus that connects all quadrants of the city to the existing Riverwalk along the Chattahoochee River. The first segment of the Dragonfly system links the existing Fall Line Trace to the Riverwalk at 14th Street. With the missing link completed, the Fall Line Trace coupled with the existing Riverwalk will provide citizens with a seamless, 25 mile-long trail from north of Columbus State University to Fort Benning. The project provides a 12-foot wide asphalt trail that includes two park and ride/rest areas, and involves improvements to several bridges, including the railroad bridge that crosses over I-185; and various hardscape and landscape improvements, such as benches, trash receptacles, and signage. People who use the trail will be able to access it from parks, numerous railroad crossings, and trail spur connectors. In addition to making transportation a little easier and greener, the trail also offers a superb route for recreational bikers, joggers and walkers to enjoy daily exercise and the sights of Columbus. Stay informed about the Columbus Dragonfly Trails by following the Dragonfly Trails Facebook page.